There is a Carnival that you can buy with $1200 all-inclusive tickets, a Carnival that you can purchase by scrolling a catalogue on-line, and a Carnival where rum, bacchanal and bum-bum time prevail. There is another Carnival that you cannot access with money, that requires you to earn trust over time and one on one, and that cherishes sacrifice, strength, and preparation through abstention from alcohol, meat and sexual relations. You could put on a costume, but you soon learn that carrying it is more about discipline and seriousness than jump up and freeness. You could want to practice fancy steps and fling rope, but you soon realize there are stories to respect, bush leaf tea to drink, root and flower medicine to rub, and a rhythm you have to hear before your mask could transform into a mas, and before you can crack a whip like a conductor leading an orchestra drumming on nothing but thin air. There is a Carnival, weaving through the masses of bikinis and beads, which most will never notice. They will think they are merely seeing “traditional” colours on display, not realizing that a small group of the fiercest and most feared in the country could only dazzle so because of old secrets still shared beneath the boom of big trucks. 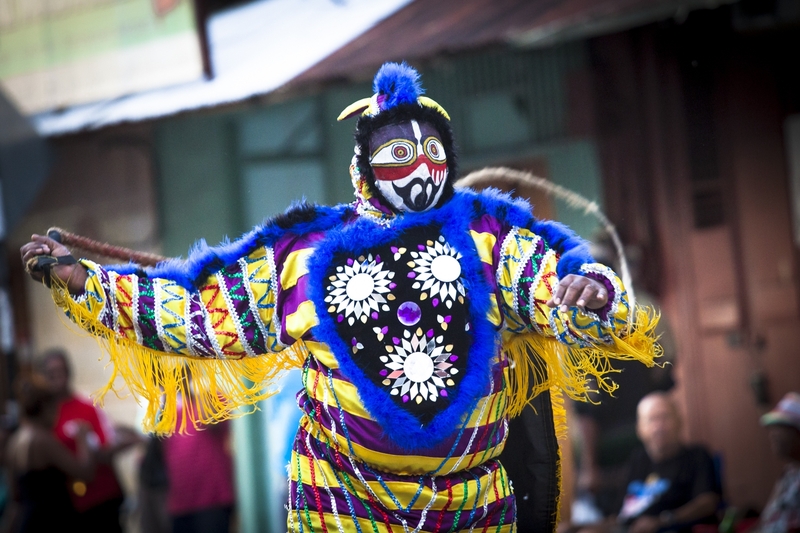 Like plants scattered across the central range, some of those secrets come from India, some from Africa, some from Amerindians, and some were invented precisely because Carnival was created right here. This is the Carnival where such knowledge is both fiercely guarded and handed down over generations. So, come Monday and Tuesday, all those secrets, from a powerful foot stance to a remembered battle chant to a sun-drenched oil to a special weave of natural and man-made fibers, make a convois with the mirrors, sequins and whips, creating a battalion of uniquely painted, tightly wired faces advancing, seemingly, without emotion or fear. Yet, in this Carnival, commitment to nation and culture is so deep that the hurt it risks could, just almost, stop a man from taking his art on the road. You see, MPs could break hearts with promises they don’t keep, and the recognized VIPs are those with office, who set rules and write cheques, rather than those with life-earned skills and leadership. Still, this is a Carnival refusing defeat, so a front yard might not be paved this year or next in order to give all to dreams of community, and a vision for a Jab Jab Academy, deeply grounded in relationship to land, will yet again be defended from party financiers and strong-armed police. In this season when men lose their reason, it’s clear that if a Jab Jab Whipmaster’s spirit don’t take you, there is only one Carnival you will ever know, the other one slipping by, right under your gaze, but unseen. As I listened to his stories of both sharing and protecting, I walked amongst his sacred plants, shared his quiet anger at the disrespect and poverty faced by traditional mas makers, felt his untold anguish at the clearing of forests where memories were held and spirits released, and appreciated the value of fairness in the life of a family committed to mas. Last Sunday in Couva, I learned that one thing a Whipmaster knows is how to take pain, which is why so many of his secrets are for healing. Yet, as I left, I wondered if those secrets, meant to protect the skin under the material and masks, could also protect from a Carnival whose injustices cut more deep than lash.